Deceptively, this book begins with a startling and a bit of an uneasy sense of slightly diminished chaos, as we are introduced to the book’s title cop character Eddy Harkness living a life both in the shadows and light of more polite society. During the night, he engages in activity that might be construed as criminal activity by some, and by day, he must act in accordance with the precepts of his position. During the day,he behaves like a more mundane cop, mechanically emptying parking meters, in a desultory way that almost mirrors the loss of excitement of his previous, more dignified position as a full-fledged drug crime investigator for the Boston Police force. 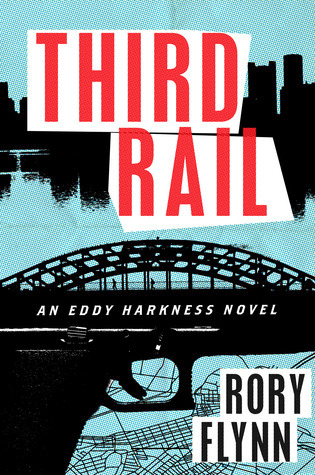 So, Rory Flynn’s darkly humorous, concisely written The Third Rail begins with a story-line that is slightly derisive, in the way it pokes fun at the devalued nature of Ed Harkness’ occupation, after his career takes a tumble for the worse after a certain highly publicized event makes him the mockery of the entire city of Boston. Now, he stumbles in the darkness of a frivolous lifestyle by night, and uncannily exists on the borders of the criminal world that he once investigated for more official, less degrading duty. Yet, he strives to get his position and reputation back. The story of a diminished hero- now existing as an anti-hero in a sense- is a story that compels readers to readily sympathize with the character’s plight, even if we might somewhat agree with the opinion of others in the story that Eddy Harkness is basically a bit of a pathetic loser at this point of his life. And at the beginning, you ponder this, as you become immediately engaged and concerned with his story, and the crime at the heart of the story, because Rory Flynn’s smooth writing really helps you become concerned with the story’s outcome. At only 210 pages, Rory Flynn’s novel is a fast-paced read, but there are times where it is a bit formulaic. It really is at its best, when it is darkly and satirically humorous, poking fun at the humorous incompetency of the character of Eddy Harkness, in terms of his professionalism in his job. The slight formulaic edge of the actual development of the crime and some of the dialogue of other characters (who sometimes exist as more than stock characters, but can slip back easily into that more dull role) is what really prevented me, in the end, from ultimately loving the story. Nonetheless, I enjoyed it a lot, it was very entertaining, if mostly for the well-developed humor of the story, and the character of Eddy Harkness is a very interesting, rather likable personality. With my criticism aside, the writing is still pretty competent, even if certain tropes that haunt the thriller genre appear a bit far too often. Of course, you may have an entirely different opinion of this book, so I definitely still recommend it. Maybe, you’ll beg to differ about my opinion, and that is perfectly alright. Rory Flynn is definitely a skilled writer, who writes very entertaining, very well-paced stories, even if I thought that they were a bit bogged down in predictable, formulaic elements. So, if you’re planning on heading to the beach this weekend, nab yourself a copy of The Third Rail. If you enjoyed it or didn’t enjoy it, I’d love to hear your feedback!